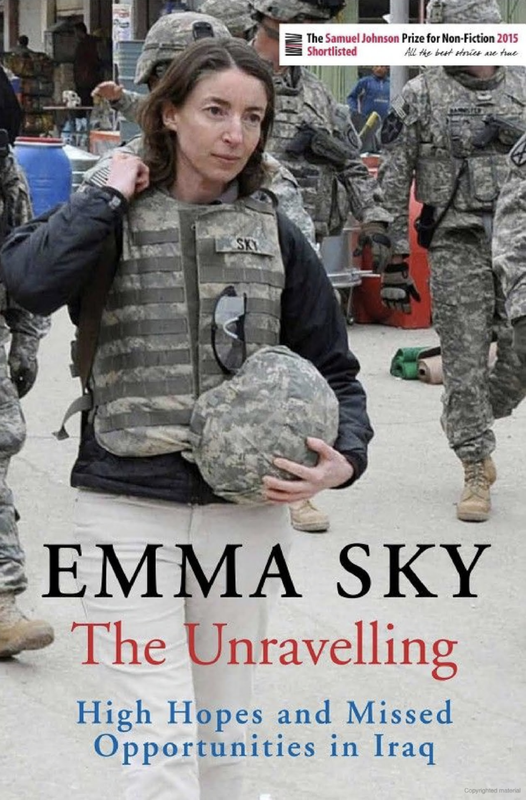 I have an almost instinctively antipathetic feeling towards Emma Sky’s The Unravelling, which resurfaces every so often throughout her book. Oddly, the more I read, the more I was sure she would have felt something similar had she been merely reading it as opposed to being the book’s narrator. Ultimately, however, The Unravelling is a must-read for anyone interested in the 2003 invasion of Iraq, and its catastrophic consequences. In the lead up to the war, Emma Sky knew her own mind, and it was determinedly against the US-led invasion. She claims to come from an unremarkable, albeit broken, home, though her schooling (her mother was a matron at a private school, where she became a pupil) suggests different. Compared to run-of-the-mill working-class kids in the UK, this alone meant she was in a different league in life opportunity terms. It helps if such an opportunity comes with intelligence, and she won a place at Oxford, where she further developed her passion for the Middle East. She worked for NGOs and the British Council there, promoting peace between the Palestinians and Israelis. She volunteered for three months to help in the aftermath of the 2003 invasion, and – reflecting the Allied lack of a robust plan for after the defeat of Saddam Hussein – quickly (and still, for me, inexplicably) became the de-facto governor of the province of Kirkuk. Almost comically, as she told the UK’s post-war Iraq Inquiry, she received no prior instructions as to what her job would be, never mind being named as a governor. She went on to become the political advisor to the US military, notably Colonel William Mayville and General Ray Odierno, both of whom come out of Sky’s book vey well. As well as providing great first-hand contextualisation of various ethnic, religious, geographical and personal disputes across the country, she does not exculpate the US for its role in the ‘unravelling’ – even if she might frustrate some in her refusal to be more brutal in her criticism. She chides Joe Biden and President Obama for their support of former prime minister Nuri al-Mailiki, in the face of clear evidence that he was becoming increasingly authoritarian and factional, and that a civil war might result. Sky was right in opposing the war in the first place because she had an inkling of what might come, and she was right in her reasons for opposing Maliki. And though it is tempting to damn her for being there, for her claim to have played a role on the ground in offsetting the worst instincts of the occupiers, it’s clear that she genuinely believed in what she was doing. At the heart of The Unravelling is Sky’s desire to engender a better understanding between different sections of Iraqi society, and between Iraqis and the US military. And though it hardly makes my scepticism of the book completely disappear, this, alongside the fact it’s a compelling read, goes some way to dampening it. The problem of the history of Iraq, it might be argued, is that for too many people it starts with the so-called first Gulf or Iraq War in 1991, takes in the second Iraq War in 2003, perhaps also the discovery and execution of Saddam Hussein, not forgetting oil, and it might then conclude with something about sectarian violence, utter chaos, ISIS and perhaps refugees. But millennia before the US-led invasions of 1991 and 2003, Iraq played a leading role in world history. On the one hand, damned for its advantageous Middle Eastern location (with the Tigris and Euphrates running through it), it was the cradle of civilisation and as far as we know the location of the world’s first towns and cities, dating back to 5000-6000 BCE. Reflecting this history and in fewer than 400 pages, John Robertson’s Iraq. A History is a masterful book that takes readers on the most remarkable of journeys, starting in ancient Mesopotamia. It skilfully takes in countless ‘firsts’ in world history, and dissects geographical, cultural, tribal, religious and economic factors that continue to feed into what is now called Iraq. There are great civilisations, from the Sumer in the floodplains of the Tigris and Euphrates, the first writing in the form of Cuneiform, the Code of Hammurabi from Old Babylonia, great architecture and rulers, not forgetting countless invasions, just some of whom have been Genghis Kahn, Arab tribes, the Ottomans, British and Americans. Affluence and plenty are as much a part of Iraq’s history as the suffering, and even its greatest cities have been destroyed, sometimes rebuilt. Today Iraqis – with millions still displaced due to the 2003 US/British invasion and the subsequent terror inflicted by ISIS – continue their attempt to come to terms with the devastation inflicted on their country. Many mourn the destruction, some are no longer able to return home, and some even long for the seemingly old stability of the Saddam decades. So, in the wake of such recent history, it’s self-evident that there is no good news from Iraq, isn’t it? Actually, no, this is far from incorrect. Thankfully, decent journalists are returning to Iraq, reporting accurately that despite everything, a sense of ‘normality’ is slowly returning. Families visit shopping malls, watch films, cook and discuss the future. Of course, with ISIS still in existence, long-term water-supply and general infrastructure challenges, economic dislocation (and an over-reliance on planet-harmful oil extraction, coveted by many countries), alongside the inevitable outside interests, such as Iran, the US, Israel and Saudi Arabia, and a society to a degree split on religious or ethnic grounds, it doesn’t pay to be complacent. Indeed, many doubt the viability of the country, suggesting it cannot be held together in the medium term. 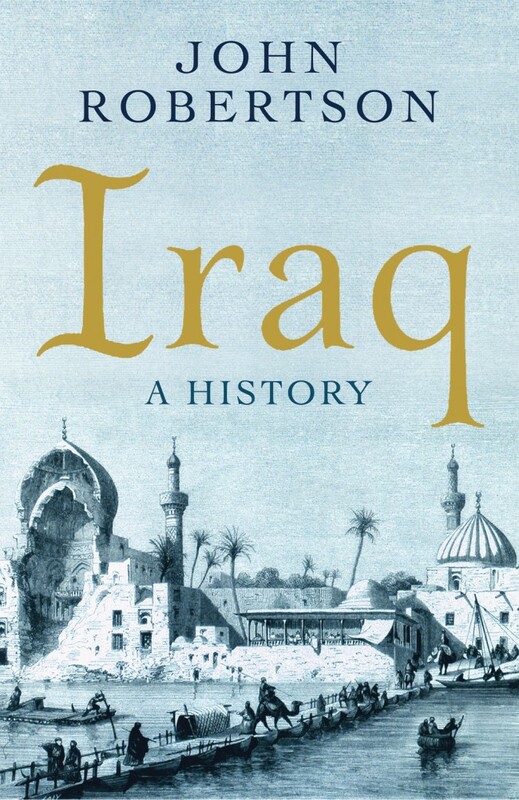 But as Robertson’s book shows, though there is no quick-fix solution, Iraq should not be written off – if for nothing else than a country with such a long and fascinating history surely has something to offer modern civilisations. Every so often, you read a book and recognise its importance, though it’s not always easy to understand exactly why. With Darren McGarvey’s Poverty Safari, almost every page makes you think, rethink, question and reflect. Glasgow-born McGarvey, also known by his rapper name of Loki, has for more than a decade worked with people in the city on the issue of poverty. He’s made programmes for the BBC, been a commentator and speaker as an expert on the issue and he’s told his own story of being raised with a sometimes violent, alcoholic mother, and his own subsequent addictions to alcohol, fast food and drugs. 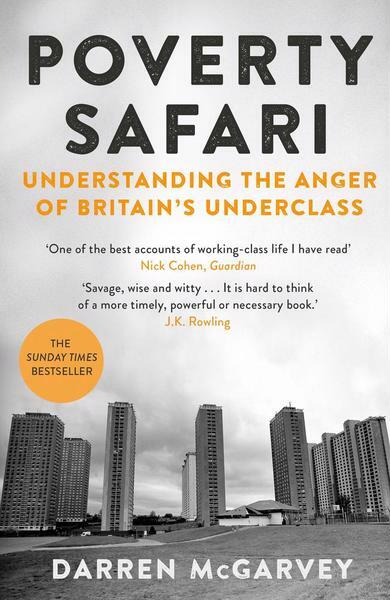 Poverty Safari draws readers in with McGarvey’s personal story and why he became a socialist, a left-wing activist and campaigner. Its brilliance, however, is its uncanny ability to engender a semi-comfortable feeling at the same time as jolting readers out of their liberal-left comfort zone as he questions his – and their – beliefs and motives. It’s uncomfortable and it’s challenging. A pathological belief that only the state can resolve this issue is both disempowering and self-defeating in the short and medium term. This is not submission; this is to acknowledge the complexity of the matter. Once you accept that the government isn’t going to fix this issue any time soon, it whittles down the options. It removes some of the onus from governments and places it directly on us. I was so consumed by my own anger and moral certainty, it had blinded me to the fact that Ellie Harrison, in all her middle-class glory, was not an enemy, but an ally in the war I’d been fighting all my life. Happier inside his own skin, it was a reflection of McGarvey’s ongoing attempt to come to terms with his own difficult past, his anger and at the same time as reasserting his fight against poverty and injustice would continue. Krishnan Guru-Murthy of the UK’s superb Channel 4 News did an interview with McGarvey, which is well worth watching. Glaswegian rapper Loki is this year's Orwell Prize winner for his book 'Poverty Safari'. He talks to Krishnan about how he negotiated a difficult childhood and an alcohol problem, how he thinks poverty can be tackled and why the left need to reclaim the idea of personal responsibility. As an aside: when reading Poverty Safari on an S-Bahn in Munich in late December, a young woman recognised the book and asked me about it. She was actually from France and explained that one of her friends works for a German publishing house, which was considering translating and publishing it. Though focused on Glasgow, McGarvey’s observations and experiences would certainly add a great deal to the debate on poverty in Germany, too.